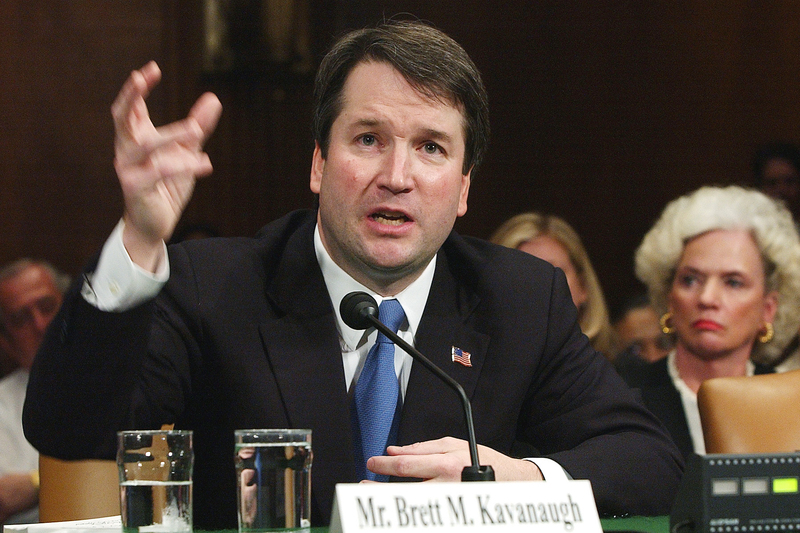 WASHINGTON (CN) – Hungry for insight into the mind of Supreme Court nominee Brett Kavanaugh, legal scholars and interest groups have devoted weeks to dissecting the judge’s writings from a tenure with the D.C. Circuit that spans over a decade. Ilya Shapiro, a senior fellow in constitutional studies at the libertarian-leaning Cato Institute, said what differentiates Kavanaugh from the high court’s other four conservative justices is his focus on administrative law. Because of the time he spent on the D.C. Circuit, as well as its location and jurisdiction over appeals of federal agency actions, Kavanaugh has developed a more detailed record on the subject than even fellow D.C. Circuit alumnus Chief Justice John Roberts. “There really hasn’t been someone among the conservatives that has been making a name for himself in that area,” Shapiro said in an interview, contrasting the nominee against the outgoing Justice Anthony Kennedy. Perhaps it is no coincidence, then, that Kavanaugh’s most scrutinized opinions are in cases touching on this area of law. First among these is the 2017 statement Kavanaugh gave when the D.C. Circuit opted not to hold an en banc rehearing of a challenge to the Federal Communications Commission’s 2015 net neutrality rule, which altered how the government regulated the internet. Shapiro also said Kavanaugh has expressed interest in changing the standards under which courts give deference to administrative agencies. Known as Chevron deference, courts are to defer to agencies when they make a rule under an ambiguous statute, so long as the rule is not arbitrary or capricious. President Donald Trump’s first Supreme Court nominee, Justice Neil Gorsuch, similarly questioned Chevron, but Shapiro said Kavanaugh’s focus is slightly different. Whereas Gorsuch advocated for raising the bar for when courts find an agency’s rule reasonable, Kavanaugh seems more in favor of courts being less quick to defer to agencies in the first place. A 2016 majority opinion that found the structure of the Consumer Financial Protection Bureau unconstitutional also offers insight into Kavanaugh’s views on executive power. In that case, mortgage lender PHH Corp. challenged the organization of the CFPB, which has a single director who serves five-year terms and whom the president can only remove for cause. Congress created the bureau in the wake of the financial crisis and gave the organization broad power to regulate banks and other financial institutions. According to Kavanaugh’s opinion, the CFPB as originally designed was to be an independent agency led by a group of commissioners the president could only remove for cause. This is a relatively common arrangement in the federal government, with familiar agencies like the Federal Communications Commission, the Securities and Exchange Commission and the Federal Trade Commission all having a similar structure. But after the House of Representatives passed the Dodd-Frank Act, the financial-reform package that, among other things, created the CFPB, the bureau’s structure changed. Instead of a group of commissioners, a single director would lead the agency. The president could only remove this director for cause. In a 101-page majority opinion released in October 2016, Kavanaugh wrote this arrangement gave the director of the CFPB “more unilateral authority” than anybody in the federal government except the president. Kavanaugh found this investiture of power in a single, unelected official ran directly counter to the framers’ decision to place the full executive power in the hands of the president, who faces a nationwide election every four years. While other officials in the executive branch are either constrained by the threat of the president firing them or, in the case of other independent agencies, by other commissioners with competing views and ambitions, the director of the CFPB can operate with relatively few limitations, Kavanaugh wrote. “The CFPB’s concentration of enormous executive power in a single, unaccountable, unchecked director not only departs from settled historical practice, but also poses a far greater risk of arbitrary decision making and abuse of power, and a far greater threat to individual liberty, than does a multi-member independent agency,” Kavanaugh wrote. Kavanaugh’s opinion came nearly a decade after he filed a dissent in a similar case called Free Enterprise Fund v. Public Company Accounting Oversight Board. That dispute centered on the Public Company Accounting Oversight Board, which was lead by five SEC-appointed members who could only be dismissed for cause. Foreshadowing his majority opinion in the CFPB case, Kavanaugh wrote the structure of the PCAOB “effectively eliminates “the president’s ability to control the regulatory focus of the board. A majority of the D.C. Circuit upheld the board’s makeup, but the Supreme Court eventually determined that its structure violated the Constitution and required that the members be subject to at-will firing. In a report released on Thursday, the NAACP Legal Defense Fund argued that the PHH and Free Enterprise Fund cases together show Kavanaugh has an inclination toward a strong president able to shape the executive branch to his or her will. Referred to as “unitary executive theory,” the group raised concerns that Kavanaugh’s view of executive power would impact how he rules in cases touching on presidential powers. Sure to earn much scrutiny at Kavanaugh’s confirmation hearing next week is his 2011 dissent in a challenge of Washington, D.C.’s gun-registration law. Though the Supreme Court had struck down the city’s outright ban on handguns three years earlier in the landmark case Heller v. District of Columbia, the later case, aptly called Heller II, focused on D.C.’s ban on semiautomatic rifles as well as its registration requirement for all guns. When his colleagues voted to uphold the revised law, Kavanaugh wrote in dissent that they erred in employing a balancing test, where the interests of the government were weighed against the interests of gun owners, rather than looking at the “text, history and tradition” of the Second Amendment and gun regulations. Kavanaugh contended that the distinction drawn by the majority between semiautomatic handguns, which the Supreme Court held the city could not ban, and semiautomatic rifles was not a meaningful one. 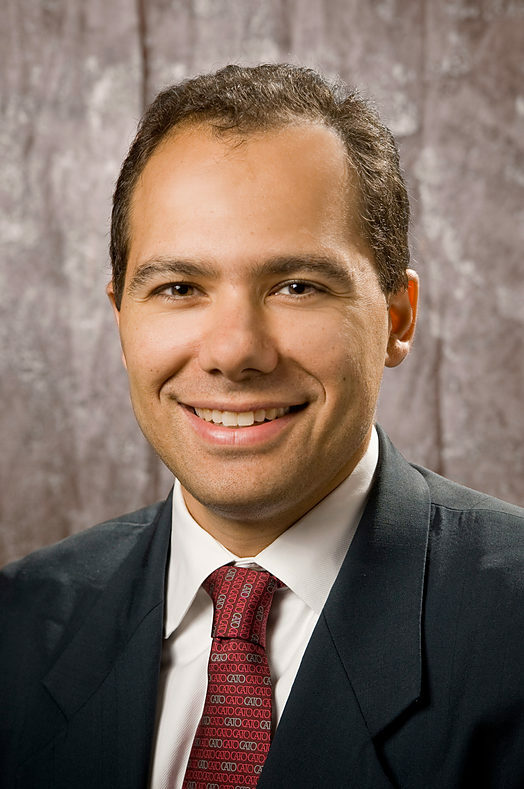 Randy Barnett is the Carmack Waterhouse professor of legal theory at Georgetown University, and is also director of the school’s Center for the Constitution. 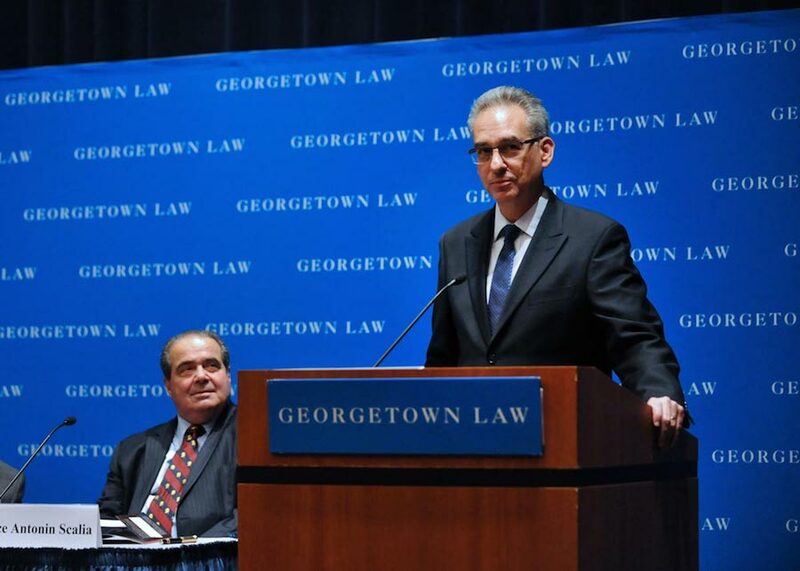 Here Barnett is seen introducing Supreme Court Justice Antonin Scalia for a public appearance at Georgetown’s Law Center. More than a hint at how Kavanaugh might rule in a gun-regulation case at the Supreme Court, Georgetown University law professor Randy Barnett said the Kavanaugh dissent in Heller II opinion offers a clear example of the judge’s originalist judicial approach. Before President Donald Trump announced Kavanaugh’s nomination on July 9, Shapiro expressed some reservations about the judge’s track record on criminal-law matters. After reviewing more of his opinions, however, Shapiro now says one can distinguish between Kavanaugh’s views on issues of national security and those involving domestic criminal rights and procedure. To illustrate this, Shapiro pointed to Kavanaugh’s statement after the D.C. Circuit decided not to rehear en banc Klayman v. Obama, a challenge to the NSA’s collection of internet and telephone metadata. Explaining why he sided against a rehearing, Kavanaugh wrote that the plaintiffs challenging the program had not shown a likelihood of success. Citing lawful government activities, like checkpoints for drunken drivers and airport-security screenings, Kavanaugh wrote the government has authority to conduct broad searches when it shows a “special need” to do so. Shapiro contrasted this with Kavanaugh’s dissent in United States v. Burwell, a criminal case involving a bank robber who was given an enhanced sentence because he committed a crime spree using a gun that could switch between automatic and semiautomatic. The majority held the government did not need to prove the robber knew the gun he used was capable of firing automatically, but Kavanaugh disagreed, calling the principle of mens rea a “bedrock historical foundation” of the American and English legal system. He noted defendants who use a semiautomatic weapon face a 10-year mandatory minimum, while those who use an automatic weapon face a mandatory 30 years in prison. This difference should mean the government must be held to higher standard, Kavanaugh wrote. Shapiro said the contrasting decisions in these cases give him the sense that Kavanaugh, while deferential to the government in national-security cases, holds it to a high standard in “run-of-the-mill” domestic criminal matters. 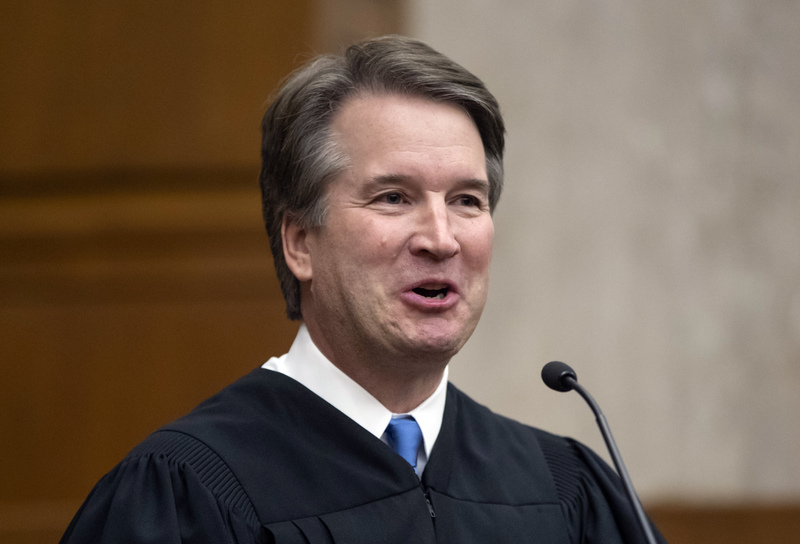 The Legal Defense Fund report made a different observation, however, based on the case National Federation of Federal Employees – IAM v. Vilsack, in which Kavanaugh dissented from the majority’s striking down of a program that required random drug testing for federal employees who worked in special schools for at-risk youth. Kavanaugh wrote the program was “narrowly targeted” and “common sense” because the employees were regularly interacting with many students who had a history of drug use, giving the government substantial reason to enact the program without violating the Fourth Amendment.